Here in the DC area this past February was the coldest February in 36 years. And now we are bracing for another snowstorm. It has been quite a long haul, for this region (although nothing in comparison to Boston! ), and so I have felt the need to change up my regular winter breakfast routine. One way that I have been doing that is by playing with the toppings on my oatmeal. I have tried defrosted frozen blueberries, mango chunks, chopped up apple, apple sauce, every nut you can think of, and the list goes on. They have all been tasty, but the biggest hit in our house has been what we are calling “Oatmeal Cookie” Oatmeal. I have to give credit where credit is due. There are two secrets to this oatmeal: butter and salt. The butter, was my mom’s genius idea. That tiny bit of added fat, that melts in really makes the bowl taste so much creamier. The salt, came in a moment of inspiration for my husband and it really boosts the flavor to a whole new level. It also brings all of the flavors together so that this healthy breakfast really feels like a warm, nourishing, decadent treat. In a medium saucepan, combine the oats and milk. Heat on a medium heat and bring to just below a boil, stirring occasionally. When it gets just short of boiling, turn it down to low and let it cook slowly, continuing to stir occasionally. As the oatmeal cooks, chop up your walnuts. When the oatmeal has absorbed all or almost all of the liquid, take it off the heat and distribute among four bowls. 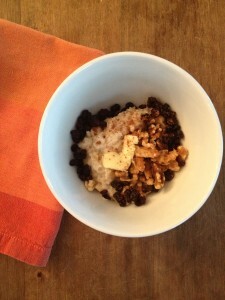 Top with the walnuts, currants, a little bit of butter (about ½ a teaspoon, or a thin slice from a stick of butter), a drizzle of maple syrup (or more, depending on how sweet you like your oatmeal), and a sprinkle of sea salt and cinnamon. Kids Note: Instead of assembling each of the bowls, put the nuts and currants out on the table in separate bowls and invite everyone to make their bowl how they like it, then help them to top with the butter, syrup, salt, and cinnamon.